Love them or hate them, the Jonas Brothers are back and their new single “Sucker” is admittedly quite the earworm. It’s not an energy-packed banger or a larger-than-life anthem, but it just undeniably works as the track that marks their return. 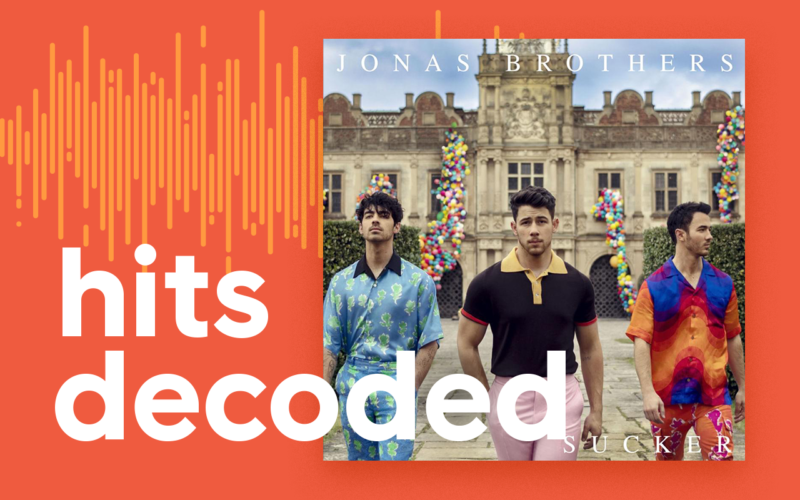 In this entry of Hits decoded, let’s explore 3 elements that make “Sucker” a solid track for kickstarting their comeback. The Jonas Brothers got their start when they were literal children, and they were still arguably pretty young when they split in 2013 – the youngest of the three, Nick Jonas, was only 21 at the time. Nearly six years have passed since, and it’s safe to say that the Jonas Brothers, and the popular music scene at large, are at a very different place since the release of “Burnin’ Up.” “Sucker” effectively adapts to 2019, incorporating new trends in music that have emerged during the group’s absence. For example, notice how the chorus starts stripped down, and then a beat kicks in eight bars later to propel the energy forward. This sort of low-key drop is a modern pop technique that can be heard in the choruses of countless other recent hits such as Halsey’s “Without Me,” Shawn Mendes’ “Lost In Japan,” and Zedd, Maren Morris, and Grey’s “The Middle.” Whether they’re conscious of it or not, the Jonas Brothers are making use of trending songwriting and arrangement tricks, rather than picking up exactly where they left off. The repetitive but undoubtedly catchy pentatonic guitar riffs also bring tracks to mind like “Cake By The Ocean” and “Kissing Strangers” by DNCE, a band that was founded by Joe Jonas and drummer Jack Lawless in 2015. Though this is just speculation, Joe Jonas may have brought new musical ideas and experiences to the table that he gained from making music with DNCE over the last few years. That said, the Jonas Brothers have also held on to a number of musical elements that feel true to their original sound. The arrangement, which primarily features guitar, electric bass, and acoustic drums, still feels like a performance from a pop rock band, which is a staple of their pre-split style. The call-and-response between Joe Jonas and Nick Jonas’ vocals and the occasional falsetto jumps are also reminiscent of their classic boy band sound. The Jonas Brothers could’ve created a more ‘modern’-sounding comeback track that featured dense production and EDM elements in hopes of landing placements in festivals and clubs, but instead they chose to play off of their original style. It seems like this move paid off, as the public’s nostalgia for their original sound likely outweighs any sort of house or trap twist they could’ve added to their music. Though the Jonas Brothers didn’t release a single new song for nearly six years, they were remembered and celebrated (?) thanks to the endless supply of jokes, quotes, and memes that they unintentionally created as purity-ring-wearing Disney stars. Even if you’re an unironic fan of the trio, it’s hard to deny that there’s just something kind of funny about them. “Sucker” shows that the Jonas Brothers are aware of this as well, and they seem to embrace the idea of not taking themselves too seriously. The playful whistles, acoustic snaps, and claps all add a lightheartedness to the track, and the accompanying music video features their wives and bubble baths instead of models and expensive cars.